Need a hearty one pot meal for dinner? 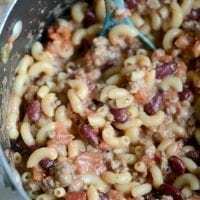 This one pot chili mac and cheese is the winner! Yall! Hi! Hello! 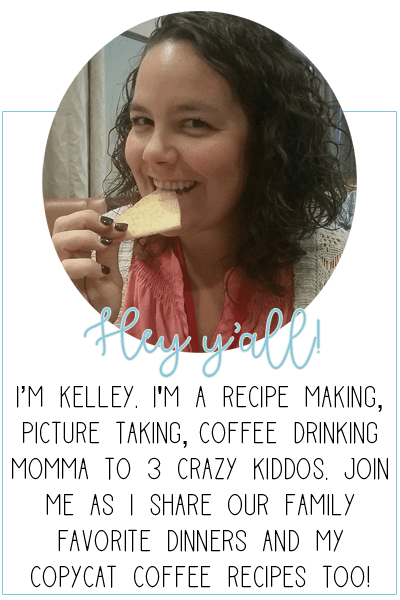 I am so very excited to share today’s recipe. It’s like a comfort food collision. I LOVE IT. 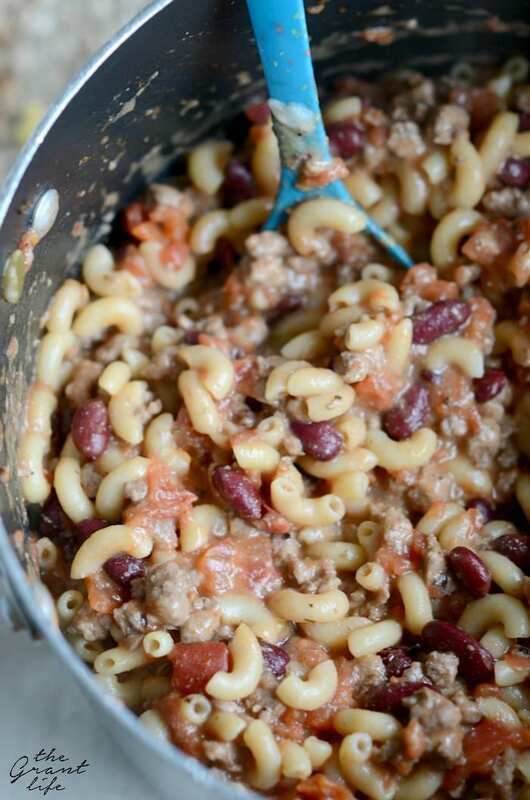 I love all things pasta and I love a good pot-full-o-chili. And I’m a HORRIBLE Texan because I love beans in my chili! That’s right. Most Texans frown upon putting beans in chili. They are all about the meat, tomatoes and spices. Me? I say BRING ON THE BEANS! 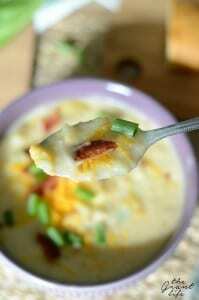 It makes it more filling, adds a little extra texture and can really stretch your pot-o-chili by adding. I am pro-bean chili loving Texan. Add some cheese in the mix and I am one happy lady. 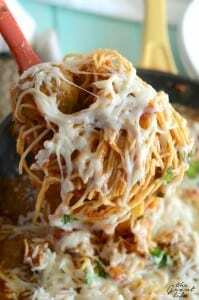 Chili and pasta AND CHEESE? Oh yes. It’s a few of my favorite things mixed into one meal. Oh.. and I made it allllll in one pot. Yup. It CAN get better and it did. On top of all that deliciousness I was able to use my new camera lens to take the photos! I had been eyeing the 85mm lens for awhile and has started saving my pennies. And then a friend on Instagram posted that her brother was selling his and to contact him for details. Well, I had enough pennies saved up and was able to buy it! It is my Christmas gift to myself. Or my business. Either way, I’m super excited to have it! I’m still learning how to use it (who knew all lenses were so different?!) but so far – it’s a winner! 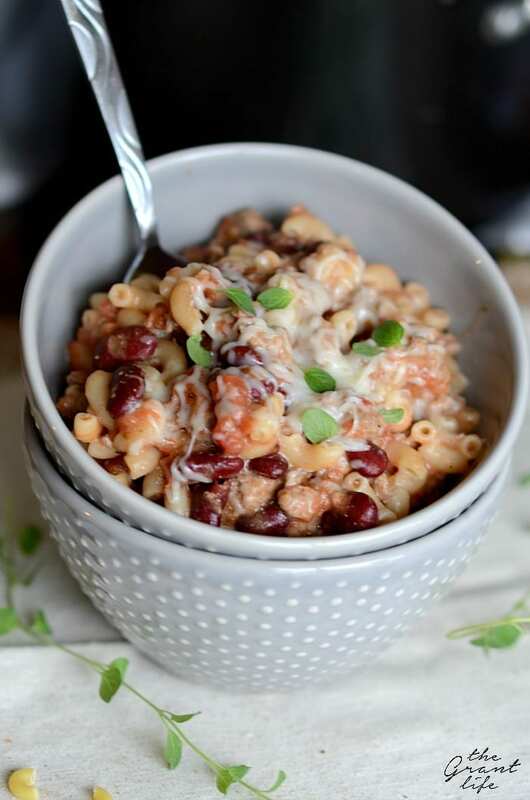 Just like this one pot chili mac and cheese! (See what I did there?) Feel free to add different spices or hold the beans if you are a no bean kind of chili person. In a large pot, saute the onion and garlic in the butter for 5ish minutes - until fragrant and translucent. Add in the chili meat along with the garlic salt, chili powder and cumin. Cook thoroughly until no pink remains in the meat. Pour in the kidney beans and tomatoes WITH their juice. Allow to simmer for a few minutes. Add in the macaroni and 1 cup of the water. Push down the macaroni so it is under liquid. Stir every few minutes so it doesn't stick to the bottom of the pot and add the other cup of water as needed. Once the pasta is tender, remove from heat and allow to cool for a few minutes. Add in the cheese and stir to coat. Top with more cheese and oregano, if desired. 3 words, got me, chili, one(as in the pot),and cheese! Thanks Kelly. Must be a chili day, 3rd chili today I pinned to my chili board on Pinterest.Crazy,how many ways one can make chili. Believe I have enough for a binder as well! Happy Holidays and thanks for this and all the many recipes I have used from your blog. Have a very Blessed New Year as well!! Thanks Teri! I hope you have a great New Year as well! I’m a Texan through and through and LOVE beans in my chili. This recipe looks amazing!!! Congratulations on the camera 🙂 Merry Christmas!! I love this recipe. I love to eat one pot meals. I will be making this in the next couple of days. Thanks. I also want to make the Starbucks cookies. I love your one pot chili. Great way to save time! This is a great recipe and it is my favorite way to eat Chili. I agree Holly, it’s so yummy!